British shipbuilding has been told to consolidate for years. Dependent on Ministry of Defence orders, it has been forced into mergers and closures and brought under BAE Systems. But now, under a review set up by the UK Government, that whole process seems to going hard a-stern. 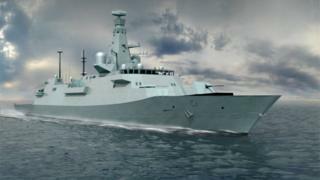 In Scotland, Sir John Parker's shipbuilding review is being seen as a big threat to the security that the Clyde yards thought they had won little more than two years ago, with a monopoly on building the Royal Navy's so-called "complex" warships. The industrialist points out that an order book for eight Type 26 frigates lasting until the 2030s offers rather more certainty than most workforces can anticipate. But look beyond the Scottish concerns about this review, and you can see a sharp rebuke to BAE Systems and even more so to the Ministry of Defence for its procurement processes, while a big chunk of industrial policy may be emerging. What was not clear when Sir John was given the review task earlier this year, but is clear now, is that HM Government has had enough of its dysfunctional relationship with BAE Systems, and wants it re-set. Having shown that a ship can be built in several yards at once, and then assembled (the aircraft carriers in Rosyth, that is), they now know that clever computerised design can make that happen for future "modular" shipbuilding. The means of driving this hot rivet into the industry is through the next class of frigate, the Type 31e. 'E' is for export. In other words, an attempt to open up to the bracing world of competitiveness. No longer is there a need to build bespoke ships, he says. On-board showers for the crew don't have to be specially designed, but can be bought in. Engine rooms can be better automated. So can ships' galleys. In short, both in the building and in their operations, the Royal Navy could be much more efficient. What Sir John has identified is a woefully inadequate procurement system, in which the participants he has interviewed feel trapped in a cycle of incompetence. That's literal incompetence. The Ministry simply doesn't have the project management skills it needs. The Treasury doesn't come out of this much better. By annually raiding the budget for major MoD procurement, it messes with the plans, pushes up the costs, and leaves military planning in a mess. Or in Parker-speak, the lack of an assured budget means each ship programme is "subject to annual arbitrary change, with accumulative negative impact on time and cost, with accompanying increased risk of obsolescence". The total package of management failure "leads to significant growth in specification, scale and end cost of ships, with an associated risk that equipment/systems are technically obsolete before the contract is finalised". So for each delay of the project by 1%, it is estimated by the MoD, the cost goes up by 0.38%. It gets worse, and blunter. Allied to inadequate risk contingency, this results in "a vicious cycle of fewer and much more expensive ships being ordered late and entering service years later than first planned. This means ageing ships are retained in service beyond their planned lifespan resulting in further refit and maintenance costs. Anyone even vaguely familiar with Ministry of Defence procurement ought to be shocked at much of this, but they shouldn't be surprised. Will it ever learn? Can it get better control over the private sector employers (and one in particular) on which it depends? Sir John Parker offers some ideas. He says the Clyde yards could learn from the other shipyards around Britain, which are not protected by the state monopoly of BAE Systems on the Clyde. Private sector contracts set a price early, they make clear who bears the risk, stick to schedule, they win contracts competitively, and are nimble enough to go after other fabrication orders, such as those from offshore wind energy. He's suggesting that shipbuilding could and should do as the the car industry has done. It has gone from British Leyland days, with notorious inefficiency and quality problems, to the super-efficient Japanese-owned plants from Sunderland to Swindon and, in particular, Indian-owned Jaguar Land Rover. The good news for the Britain shipyards is that Sir John thinks Britain should retain its shipbuilding capacity for the Royal Navy. That does not apply, he says, to the next batch of non-complex ships to come up for contract. They could follow the last ones and go to a cheaper shipbuilding nation, such as South Korea. But if British yards learn to compete, there could be a reward in beginning to win export orders again. He does not address the point that other countries may want to buy BAE designs, with which to build ships in their own yards. But even an export contract for design would be a novelty for Britain's military shipbuilding.